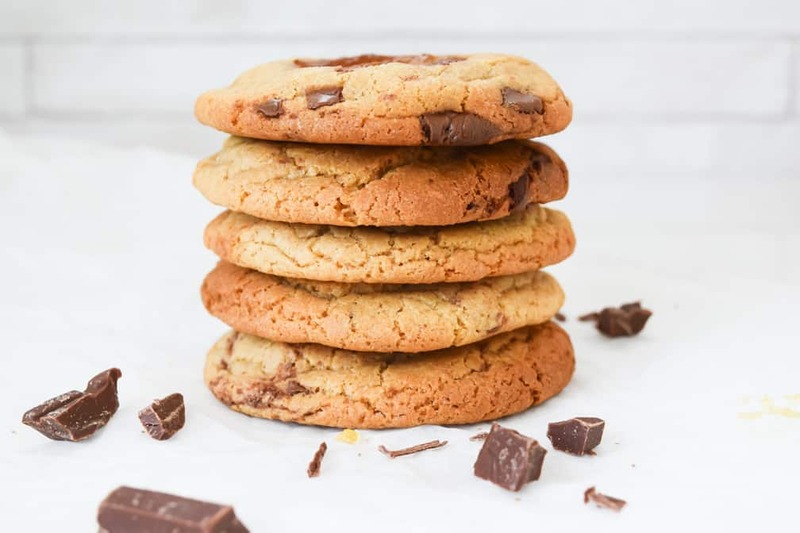 With the wet weather hanging around, what better way to spend some time indoors, than baking cookies! 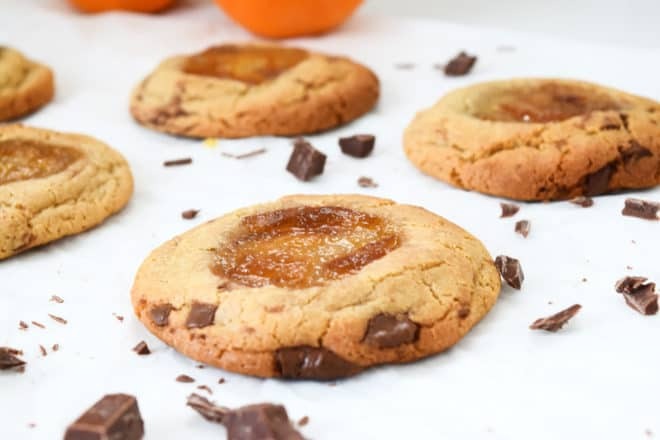 These Chocolate Orange Cookies are a great choice for a baking day! Bam Bam had an amazing time at his first pony show. I was mega proud, nervous, excited and worried all in one go. Bam Bam on the other hand, took it all in his stride and relished in the attention he receives whilst proudly trotting around the arena aboard his beautiful little pony. He won his first rosette, coming in at a respectable 6th place and I secretly shed a proud mummy tear. I will admit, that “Beautiful Little Pony” had fallen far out of my favour that morning however! After spending hours (and I mean hours) the day before. Scrubbing the dirt, mud and dust from her coat. Polishing her hooves, conditioning her mane and tail with items more expensive than I put on my own hair and tucking her into bed in her special “after bath” rug. The tiny terror had the audacity to choose that particular evening to work out how to free herself from the confines of her stable and escape into the nearest and muddiest field possible and undo all my hard work by rolling in as much mud as she could! Believe me, she was the furthest you could get from a “Beautiful Little Pony”. So, after spending the first half of the weekend outdoors in the rain, we needed a baking day! All I could think about were cookies and I had also bought some orange flavoured chocolate which hits the shelves around this time of year. 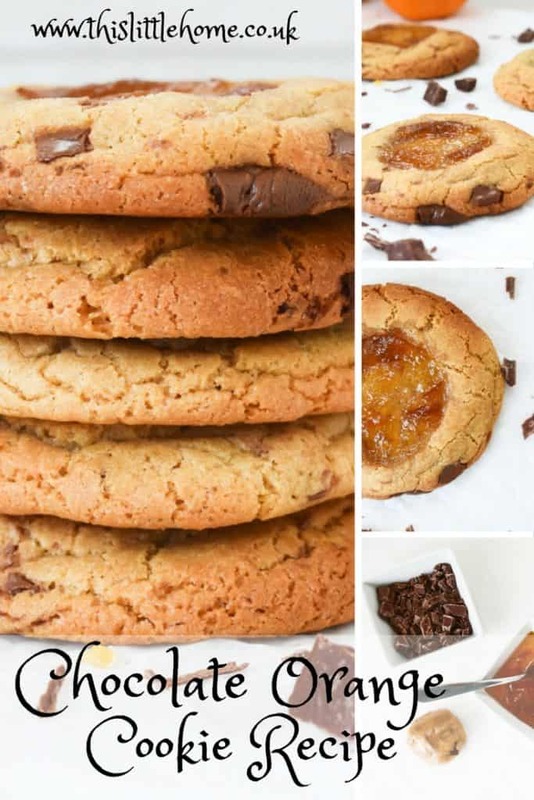 I set to work combining them and creating these chunky, chewy, chocolate orange cookies. I struggled to allow them time to set before sinking my teeth in. But, since they are so easy to make, you have a great excuse to double up and make an extra “test” batch. 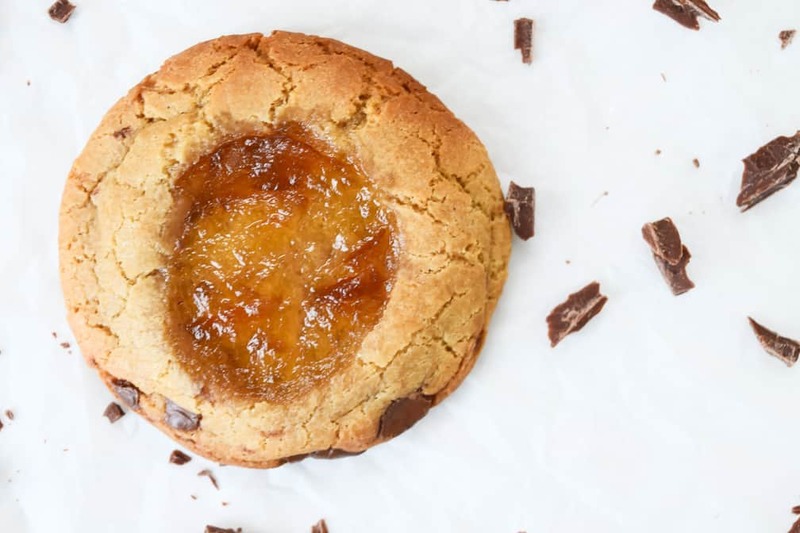 Try these Creme Egg Stuffed Cookies Now! Place flour, baking powder, salt and sugar in a bowl and mix thoroughly. Melt the white chocolate, oil and butter in a saucepan over a gentle heat, once melted add to the flour mixture and mix until it all becomes crumbly. Let it cool, then add the egg and beat to form a stiff dough. Divide the dough into 10 weighing roughly 50g each. 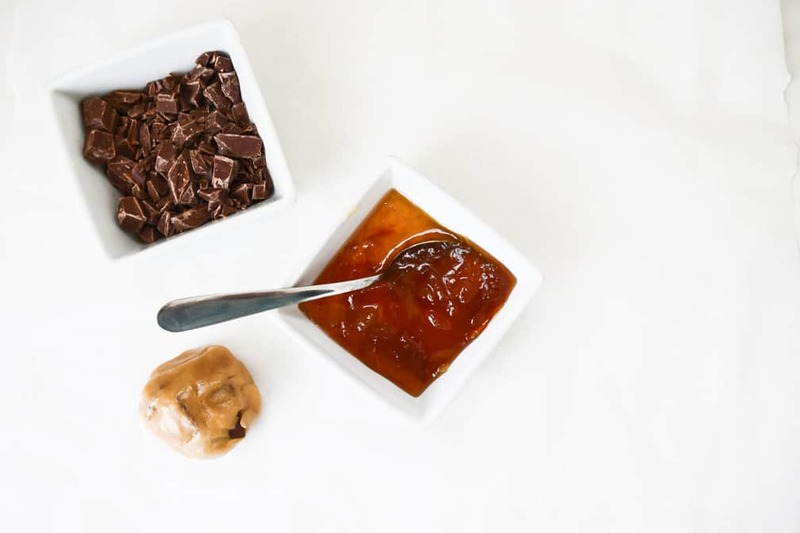 Chop the orange chocolate into small chunks and add 10g to each piece of dough. Form each piece of dough into a ball and place on a lined baking tray with plenty of space between each one to allow them to spread. Bake in a preheated oven at 170oc (160 oc fan assisted) for 10 minutes. 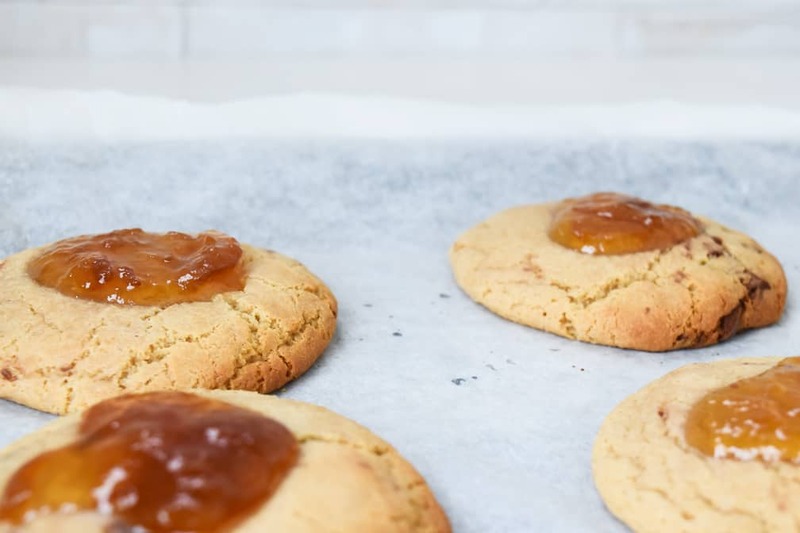 Remove from the oven and spoon a tsp of marmalade over each cookie. Return to the oven and bake for another 5 minutes. Remove the cookies from the oven and leave to set on the baking tray. Once they have begun to cool, transfer them to a rack to finish cooling. Store in airtight containers for up to 3 days. Love thumbprint cookies. These look so moorish, addictive & the orange with chocolate flavour is definitely one of the best! Thanks for visiting Thalia, I totally love the chocolate orange combination too!